The Van Elslander Cancer Center, located in the St. John Hospital complex, provides patients seeking treatment as they journey down the troubling path of cancer treatment. The Center provides a variety of treatments and has a great track record in helping people get back to their normal lives. The Center was looking for a way to inspire and give these many patients a uplifting feeling and to highlight the hope in their treatment. There is an old Chinese proverb that says that a 1000 Cranes will bring you hope and peace. 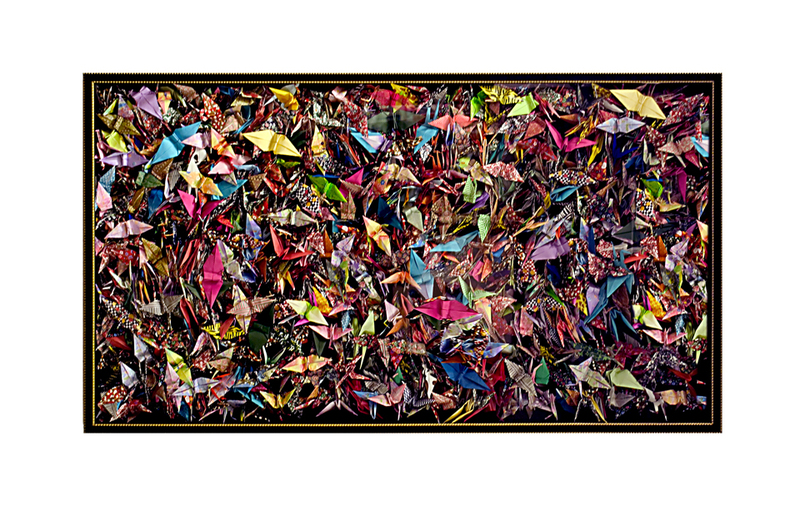 To illustrate that proverb I had 1000 hand folded Cranes constructed out of colorful paper and strung together inside a large box frame. These Cranes were folded by a group of teenagers whose lives were touched by my wife, including my three sons. This display hangs proudly in their lobby extending the hope that the Cranes bring to the patients who visit the Cancer Center. My wife was one of their patients and I created this display in her memory.